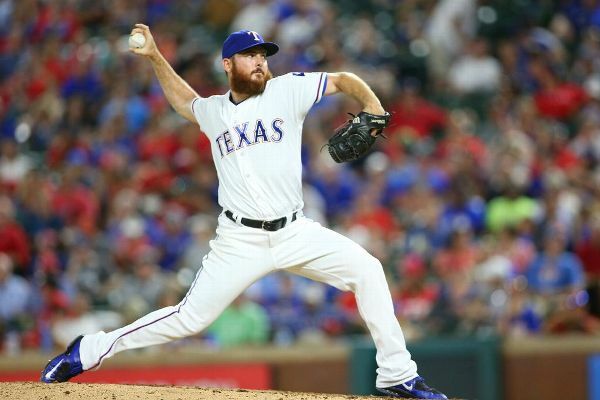 ARLINGTON, Texas -- Struggling reliever Sam Dyson was traded to the San Francisco Giants on Tuesday night, less than a week after he was designated for assignment by the Texas Rangers. Dyson was the Rangers' closer last season when they won their second consecutive American League West title. He also was a key reliever for Team USA when it won the World Baseball Classic in March, tossing six scoreless innings over five appearances. But he lost his closer role in Texas after he blew his first three save opportunities two weeks into the season. The Rangers informed the right-hander he was being designated for assignment after he gave up two homers and three runs in the 10th inning of a home loss to Tampa Bay last Wednesday. "Here's a guy who doesn't have a lot of time in, but he has a lot of experience pitching late in ballgames. He has a good arm," Giants manager Bruce Bochy said in Milwaukee, where his team lost 5-2 to the Brewers on Tuesday. "Got off to a bit of a rough start there in Texas, but we're hoping a change of scenery will serve him well." "There were a number of teams that checked in, varying degrees of interest," Rangers general manager Jon Daniels said. "Teams understood this was not a typical DFA. While Sam struggled this year, he performed at a really high level [the] last couple of years and the spring, and [teams] saw it as a pretty good chance for a bounce-back. We knew going into it, the interest would be greater." Daniels said Dyson, who has a sinking fastball with a velocity in the mid-90s, is healthy. Toronto picked Dyson in the fourth round of the 2010 draft, and he made his major league debut with the Blue Jays in 2012 before pitching for Miami and Texas. He has a career record of 12-15 with a 3.54 ERA and 40 saves in 203 major league games. "We all have our hiccups in this game, but if we can get him back on track, he certainly can help us in those late innings," Bochy said. Daniels said he likes the potential of what the deal can bring the Rangers in return. The player to be named can't be someone who is currently on San Francisco's 25-man roster.